My dear one, I, the Lord your God, am brighter than the brilliance of a sunrise! Wrapping Myself around you like a shield, I am so generous with My gifts of grace and glory. Those who walk along My paths with integrity will never lack one thing they need, for I provide it all. I am well aware of all that you need. Let go of any anxiety and trust that I will care for you. All your worry produces nothing and as you learn to rest in Me and just relax, I will work everything out for your good. As you learn to walk in trust, in your faith, you can focus on what I desire and not what you need. That is why I have given you promises that I will supply and take care of you. Come and spend time with Me and surrender all anxiety. Let Me care for you! Beloved, practice walking by faith, learn to relax in My goodness, let everything you are continually be thankful and you will rest and have sweet peace. Are you allergic to spiritual exercise? I think I’m allergic to exercise. At least it feels like it every time I do it or think about doing it. This past Sunday, Troy asked me to play tennis. How do you say no to a kid who wants to play with you? We went to our local courts and played. I’m really competitive and I don’t want my 14 year old to beat me. My 14 year old son is way more athletic than me in every way. We played and now here are my allergic reactions. I hurt. In many ways, I hurt. My shoulders hurt, my hamstrings hurt, my knees hurt. I think my spleen hurts, but I’m not sure. For hours afterwards I sat sweating and out of breath. Kristin wondered if she should call the ambulance. I may or may not have seen a bright light in the distance. Oh boy, I’m out of shape. Yet, I know how good exercise is for me. A daily regimen of physical activity makes me feel better, look better, and probably extends my life. I know these things. You don’t have to tell me. I get it. Daily exercise is good. But I still rebel against it. The list of daily excuses is as long as the list of daily benefits that are abundantly clear to me. Then Jesus told his disciples, “If anyone would come after me, let him deny himself and take up his cross and follow me.” That’s from Matthew 16. By the way, this is a command of the one who created the universe. The excuses begin to fade. Not just physically, but spiritually. It hard to exercise, and some days, it’s hard to follow Jesus. In the same way that I can rationalize my laziness, I can rationalize my lack of faith. In the same way that it’s hard to exercise, it’s hard to ‘take up my cross’. Into hard things with my family? Yep. Into the doctor’s office? Uh-huh. Even into the mortuary? Especially there. Taking up our cross daily is like exercise; it’s a present commitment for a future blessing. I’m going for a long walk now. It’s not just for my body, it’s for my soul. If I can be obedient to Christ with this old, flabby, balding body, perhaps I can be obedient with my life; a life that can be changed while it changes those around me. Oh what a great reminder, that HE truly cares about EVERYTHING that concerns us!!! Don’t leave Him out of it. My dear one, run with purpose in every step. Do not just be shadowboxing. Be direct, be focused, go into everything with the knowledge that you WILL bring Me into it, thus success. Look at every situation and ask Me what I see, what I desire and then do that. I am ready to help you with everything you do, in every situation. Whatever concerns you My love, I care about, for I desire you to succeed at everything you do. Come and spend time with Me, talk to Me about the private things, the hidden things, the suppressed things. Talk to Me about the fear that keeps you from the success I desire for you, then I will talk to you about My love, about My healing, and about My deliverance. For I didn't give you a spirit of fear, but of love, power and a sound mind. Beloved, I will place your feet on the solid Rock, make you surefooted and I will make you to shine like the noonday sun. Anyway, there are times when it gets to be a bit overwhelming, and this was one of those times, where there was almost too much month compared to our money. I glanced thru the two credit card statements and conviction washed over me as I realized I didn’t even remember what half of the Amazon charges were for! That’s a problem. 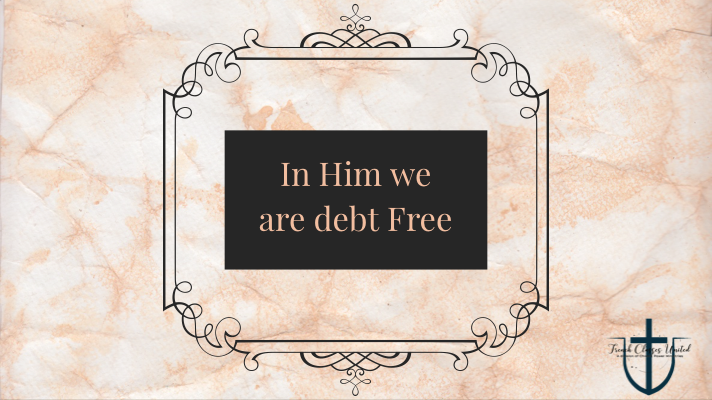 I thought back to when I had gone on a spending fast and realized it was time to do that again, to be content with all that we have instead of reaching for more. I determined in my heart to pay off the credit cards, only keep one, and truly go for the whole debt-free thing…but then again, rising utilities, house payment, HOA fees, car insurance, health insurance, life insurance, insurance for insurance   it all adds up, and let’s not forget about gas for the car to get to work to pay for it all. As if pulled out of a trance, the words of a worship song that was playing beckoned me to look up and let go and just press in to the truth that Jesus paid it all, all to Him I owe…and I remembered where my provision comes from, financially, physically, emotionally and spiritually and that with His help we would get it all paid. Just as sin leaves a crimson stain, spending can leave us with remorse. Thank you Father that You paid it all and will continue to be my provider, my protector. WE ARE NOT ALONE IN THE FIGHT! Welcome to Wednesday’s Word with Trench Classes United. Come on in for what I hope will be an encouraging message from my heart to yours. Recently there have been a series of things that have hit my wall of faith…hard, and as hit after hit pounced on my heart, shooting attack arrows at what felt like almost everything I was doing, I wanted to duck and hide, to find a rock and just climb under it and not come out until it all stopped. I wanted to just quit! But that’s not how life works, is it? We must face the attacks, allowing our faith to help us dodge the fiery darts that threaten to pierce through and weaken our faith, casting down everything that exalts itself against the knowledge of Christ. Not always easy to do, right? The good news: WE ARE NOT ALONE IN THE FIGHT! I was reminded of this well into what was feeling like an endless attack thru one of my devotionals and that day’s word was like an arrow of encouragement for my weary soul. It was armed with truth that helped to dispel the lies that were coming at me, from others as well as from my own private-party logic. The good news is we’re not being chopped off at The Vine; only pruned to have others join us on The Vine, our resting place. Think about this: when you walk by a tree, and you see all of its branches, do you ever see a branch white-knuckling it to hang on? No, they are just there, in The Vine. In the pruning process, I need to remember that growth is rarely pain free!